What a strange beast is David Cianfrance’s ‘The Place Beyond The Pines’. Audiences responded enthusiastically to this epic generational saga, while critics, though very impressed, were far more discerning about it. On paper, it sounds like an instant American classic, a remarkable ensemble cast let by an incredibly talented writer-director that meditates on the sins of parents being inherited by their children, and for the most part, everything seems to work. And yet, there’s just something about ‘The Place Beyond The Pines’ that seems a tad... lacking. For his follow-up to the acclaimed ‘Blue Valentine’ (2010), Cianfrance presents us with an epic of fathers and sons in the town of Schenectady, New York, told in three acts. We begin with Luke (Ryan Gosling), a stunt motorcyclist in a travelling carnival who, upon discovering he has a son from a one-night stand with Romina (Eva Mendes), begins robbing banks to give his son a future. We then move to Avery (Bradley Cooper), a celebrated police officer who is thrown into Luke’s orbit, while also grappling with a newborn son of his own and the discovery of corruption within the police force. And finally, we end with Jason (Dane DeHaan) and AJ (Emory Cohen), two dissatisfied teenagers who find solace in each other, only to discover they carry a link far too troubling to ignore. If Shakespeare were alive and working today, ‘Pines’ is exactly the kind of work he’d probably be making; not in terms of the quality of the writing, but in terms of the sweeping scope of the storytelling. This is a film populated by giant characters, timeless figures we have seen for hundreds of years of storytelling, boys becoming men, sons worshipping fathers, lost young men trying so hard to carve their place in the world. Cianfrance never gives us a clear definition of when the film is set, but that almost seems the point - that this saga has nothing to do with time and place, but character and circumstance, watching objects collide and explode against one another. It might be an intimate setting, but Cianfrance endows the narrative with hefty emotional weight which, coupled with remarkable cinematography by Sean Bobbit, opens up the film to a much grander scope. The performances are also mighty, with Bradley Cooper giving possibly his best performance, another charismatic turn from Gosling, and further proof of DeHaan’s emerging talent. So what doesn’t work? Well... it’s not that easy to pinpoint. By all accounts, there’s nothing wrong with any single element of ‘Pines’, except that once all the pieces are put together, something seems to be missing from the final film. I even went as far as to ask others what it was, but this seems to be one of those films no-one can even agree on. Everyone has a different opinion on which act is the best, who gives the best performance, even who the film is about. Perhaps its obvious three-act structure seems too contrived, though it may have worked better if Cianfrance had pushed it further and titled each act to make it a clean transition from one character to another. Perhaps the lack of a single central protagonist wasn’t handled with appropriate dexterity. Who knows? Maybe this is just one creation where the impressive ingredients didn’t amount to a whole satisfying result. There’s no denying that ‘The Place Beyond The Pines’ is a considerable cinematic achievement, and one worth revisiting often. With 2013 winding down, it’s also clearly one of the best films of the year. But an instant classic? For all its efforts to assure its place in the pantheon of American cinema, it only just misses the mark. There’s nothing wrong with any single element of ‘Pines’, except that once all the pieces are put together, something seems to be missing from the final film. Roadshow have gifted ‘The Place Beyond The Pines’ with a gritty and gorgeous 1080p 2.40:1 transfer that beautifully maintains Bobbit’s extraordinary work. The autumnal hues and golden light dazzle behind well-maintained grain structure, giving the film its necessary cinematic tone. Just as impressive is the DTS-HD MA 5.1 track, which weaves Mike Patton’s extraordinary gothic score with beautiful textures and realism. Overall, you couldn’t ask for a better presentation of this beautifully-made film. While there isn’t much on offer here, this isn’t one of those films that requires a special features package to support it. A short EPK gives us a few talking heads praising the team behind the film, and a collection of deleted scenes expand on much of the character material already in the film. The highlight, though, is the excellent audio commentary from Cianfrance, filled with fascinating background on the making of the film and anecdotes about the cast and crew. The 'The Place Beyond The Pines' competition has now closed. Winners will be announced shortly. Competition opens at 4pm AEST on Sunday 8th September 2013 and closes at 11:59pm AEST on Sunday 15th September 2013. Five winners will be chosen at random on Monday 16th September 2013. To successfully win, entrants must fulfil the above entry conditions before the time the competition closes. Current members/followers are eligible to enter the competition. Only one entry per person. Only one winner per household. To be a valid winner, the entrant must not have won a prize from SWITCH within the last 28 days. 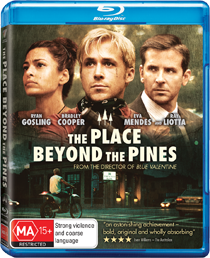 Each winner will receive one Blu-ray copy of 'The Place Beyond The Pines'. By entering, you agree to receive occasional emails from SWITCH in the future. If you decide to unsubscribe from these updates, any further entries will not be applicable. Only Australian residents are eligible to enter. 'The Place Beyond The Pines' is available on Blu-ray, Digital Download and DVD on Wednesday the 11th September 2013 from Roadshow Entertainment.